Entries are now being received for the Bowling World Cup 2019 Irish Qualifying Rounds to be held in Leisurplex Stillorgan from 8th to 9th June 2019. A printable entry form is available here. 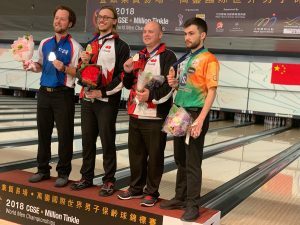 Irish tenpin bowler Christopher Sloan today finished in 3rd place at the World Men’s Bowling Championships in Hong Kong, securing Ireland’s first ever medal at an Adult World Championships. After qualifying for the finals in 6th place, Christopher then defeated defending World Champion, Francois Lavoie of Canada, two-games-to-one in a tight last-16 contest, before again winning his quarter-final match two-games-to-one against Seonghoi Koo of Korea. With Ireland’s first ever World Championships medal secured, the focus turned to becoming the first Irish bowler to make the final. But standing in Christopher’s way was American PBA Tour superstar Kyle Troup. The semi-final was tight all the way through, with the momentum swinging one way and then another, but unfortunately for the Irish fans it was Troup who came out on top, two-games-to-zero. Both games were close all the way to the end, but the American managed to get over the line in both games, bringing Christopher’s inspiring run to an end. The World Bowling Men’s Championships, which takes place every four years, saw 265 competitors take part this year, representing 46 different nations. Christopher, who is from Swords in Co. Dublin, will be in action back home after Christmas, with a busy January schedule including the ALSAA Open and the EBT Irish Open, two of the biggest tournaments of the year in Ireland. For further information, please contact ITBA Social Media Manager Jason Byrnes at jason.byrnes@hotmail.com. Irish tenpin bowler Christopher Sloan has qualified in 6th place for the finals of the World Men’s Bowling Championships in Hong Kong. 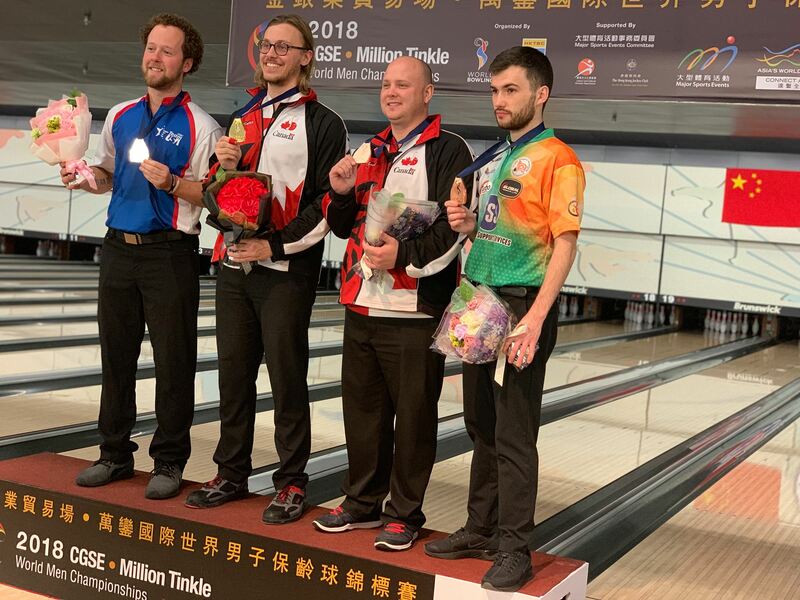 The team event, in which 6 bowlers represent each nation, saw 46 countries travel to Hong Kong to compete over 10 days in Singles, Doubles, Trios and Team of five events. Each player played 24 games in total in the tournament, and after these games the top 24 individual bowlers qualified for the Master finals. Christopher (24), from Swords in Co. Dublin, put on a stellar performance to qualify for the Master in 6th place, and in the process earned a bye to the Round of 16, which takes place on Wednesday Dec 5th at 4 am Irish time. Christopher will take on defending World Champion Francois Lavoie of Canada in the Round of 16, with the match following a best-of-three games format (first player to win 2 games advances). Should he advance into the Round of 8, Christopher would be just one match away from the medal rounds, and two matches away from the Masters Final. The finals will be streamed live on the Olympic Channel, with a link to the stream, as well as full tournament information and results, provided on the official tournament website, http://2018wmc.worldbowling.org/. The M50 Skip Hire Academy Matchplay will take place in Leisureplex Charlestown on Saturday & Sunday the 15th & 16th 2018. Sunday September 9th saw 23 bowlers take part in the first Team Ireland Technical Support Services Classic. The event took place in Leisureplex Blanchardstown over 5 games culminating in a Round Robin final of the top 4 qualifiers in both Scratch & Handicap sections. Team Ireland will be running the first Technical Support Services Classic on Sunday September 9th 2018 in Leisureplex Blanchardstown. The event will commence at 9:45am, check-in 9:15am. The event will comprise 5 games with the top 4 scratch and handicap players competing in a Round Robin final with pinfall carried forward and bonus points awarded. Player handicap is taken from Highest League Average from 2017/2018 season, Highest A.L.S.A.A Drop in Singles average (15 games) or Rocks Jewellers Tour average (15 Games). Online entry is available now, click here. Closing date is Midnight on Thursday September 6th 2018. Following the June event, updated mens and ladies rankings are now available on the Rankings page.